Vineyard Wind recently announced a $16.7 million deal with the Rhode Island Fisheries Advisory Board. The deal was made on behalf of Rhode Island fishermen who ply the waters where a farm of 84 wind turbines is slated to be built by Vineyard Wind. The farm will be situated about 14 miles south of Martha’s Vineyard. “I just think it was a [expletive] deal for the industry, but it’s the deal that we got,” Newport, R.I., lobsterman Lanny Dellinger, chairman of the Rhode Island Fisheries Advisory Board, told The Times. “I just don’t think the negotiations were set up fairly,” he said. Dellinger said that he and his fellow advisory board members were pressured with unreasonable timelines and forced to negotiate with an entity backed by a multibillion-dollar energy company, all the while running their own small businesses without any sort of compensation or help to offset the time and energy they spent. When asked if Vineyard Wind was aware squid fishermen might have not had a seat at the table for negotiations, Vineyard Wind spokesman Scott Farmelant declined to talk about any part of the deal, and referred The Times to the Vineyard Wind release. John Keene, president of the Martha’s Vineyard Fishermen’s Preservation Trust, said his organization maintains its support for a four-mile-wide corridor. Meghan Lapp, fishery liaison for Sea Freeze, Ltd., a commercial fishing enterprise with a squid fleet, told The Times she wants to see a study about transit corridors because the scale of the Vineyard Wind project has no precedent and because the scope of radar interference, if any, remains undetermined. “How far does that radar interference extend?” she asked. The Times posed several radar questions to BOEM officials when they came to the Vineyard on Feb. 12 to hold a hearing on a draft environmental impact statement for the Vineyard Wind project. The Times was told the BOEM engineering specialist was not present, and nobody else on their team could field the inquiries. Calls to their Washington, D.C., media office weren’t immediately returned on Friday. Lapp criticized the transparency of the negotiations between Vineyard Wind and Rhode Island Fisheries Advisory Board, alleging the public was kept out of key parts of the process and that some of the economic data used in crafting the deal hasn’t been made publically available. “This sets the precedent for how other projects could go,” she said. Keene said he is in support of Vineyard and other Massachusetts fishermen receiving just compensation for “known” or “expected losses” stemming from wind farms. 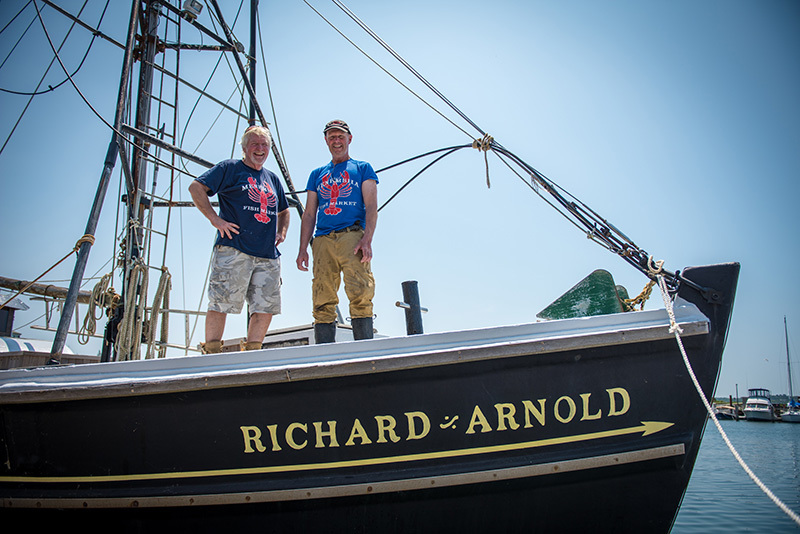 Larsen, who is about to return squid fishing to Menemsha in the next two weeks aboard the wooden dragger Richard and Arnold, waxed optimistic about the ramifications of the Vineyard Wind project. “Hope it will drive the price up,” he said. I am aware what 2 miles looks like. Crewing for my Dad, from the downwind to upwind mark was 2 miles. That’s a respectable amount of water. My respect for professional fisherman just lessened a bit. New Englander, you say you’ve lost respect for fishermen? When was the last time you tried pulling mobile gear around a fleet of 20 to 30 boats trying to compete for the same spot? Get a clue. This scam will be the death of commercial fishing as we know it. There are rules for respecting burdened vessels, such commercial boats pulling behind fishing gear. If these skippers have a problem with those rules, if they won’t respect other vessels, confirmed: my respect has lessened. I have yet to get a straight answer from anyone involved on the wind development side on all of the different lighting systems, aviation and navigation, for how they will be blinking and what safety and controls are being considered if any for vessels transiting the area. I’ve written about this issue in the past and also talked to Richard Andre about it and gotten no clear answer. On the north side of I70 on the approach to Limon, Colorado from the Kansas border is one of the largest wind farms in the West. I transited the area at night and I think for over 30 minutes at 70mph…it was freakishly distracting to have the blinking red lights flashing all the way into the horizon for 180 degrees. Being on the ocean, in a working vessel, transiting and navigating and working in the area of this offshore wind project is going to be awful at night under good conditions and I fear tragic under adverse conditions. I don’t believe this project is as much about climate change as it is about profits. I know, I’ve made plenty of money on large scale wind energy development on land. With a low cloud ceiling or in even modest fog I fear that working and transiting in this wind farm zone at night is going to cause some tragedies. Can I get a factual response please? I am VERY pro wind and I believe in climate change science. I’m deeply concerned for our future. There are much better places for these projects. If this gets built there will be some deep regrets. Mike– where do you think is a much better place for so many windmills ? Otis Air national guard base is close to the ocean and is a huge area of utilized acreage. While it may get slightly less wind, the costs to install land-based windmills would be a fraction of the offshore projects. There is ample land there so it would make sense to investigate this rather than destroy pristine oceans with a visual blight and affect marine life and fishing grounds. Having worked for the Cape Cod Times and covering the base, I can tell you that the number of wind turbines at the base is all it can handle and still be an active military training site for the Massachusetts National Guard and an airfield for the U.S. Coast Guard. The FAA won’t allow any more turbines at the base. There are also environmental issues with the number of endangered and rare species that are found on the 22,000 acres. The wind resource potential is greatest in some of the most remote parts of the country. No great surprise. From TX right on up through Alberta and Saskatchewan the resource is fantastic. The biggest issue is lack of transmission and distance to the load centers/cities. The transmission infrastructure needs to be built the same way interstates and rail lines were built out. The rural communities and farmer’s typically welcome the revenue, jobs, and tax base support. Properly done it could generate all the base load electricity requirements for the entire country reliably and at low cost. Offshore wind electricity costs are going to be very high and I think, though I’m not current on the technology, the risk of equipment failure in that environment is going to be significant. I think they are dramatically under estimating what Mother Nature and Poseidon will throw at them. I just heard the under sea cable on Block Island needs to be replaced due to degradation. I bet they thought they would get 20+ years out of that item. This is not about saving the Planet folks. It’s just about money…and making money! Richard…I asked you before and you wouldn’t answer me, what is your bonus if you get this done? I thought you were just trying to help out the Island?? Let’s have some transparency folks. The Fisherman are going to get the shortest end of this stick and they don’t have the capital or legal support to adequately fight or be properly compensated for their loss. Billions of dollars are at stake and they are being offered a pittance. This whole thing is a disgrace and we’ll get to buy the expensive power that it generates because the State and Feds want to shove it down our throat. This project is strictly a money making scheme. There will be no jobs created in this area. This is a foreign company that has experience building these things therefore will not take the time to train new help. Think of the maze of wires on the bottom running between each rig putting out an electromagnetic field that has been proven to be harmful to bottom life. Lobstermen say that near the Block Is. windfarm, they could not catch a lobster since it was activated. And what about the flicker effects that radiate out to 15 miles? This has also been proven to effect humans and wildlife. Electricity rates will skyrocket . Look at Block Is. rates. Think delivery charge on your electric bill. Building these things and maintaining them will do away with any deletion of carbon emissions. Enjoy looking out over an empty ocean now, because these things will be visible . And no more clear night visibility with the amount of lights they will be showing. This is just not the area to have these things. Why did the Europeans stop issuing permits for these and stopping future windfarms? I can’t imagine transiting thru this area in thick fog at night with other shipping in the area . I understand GPS is effected as well as the radar. I am all for clean energy but these people have got folks brainwashed into believing this is the end all to pollution. I realize there is no stopping this but be warned things will never be the same around here. Not speaking for anyone else. Out of sight of land, at night, and overcast, I like more than the compass, radar screen, and GPS (okay, LORAN; it’s been a while) as spatial references. Whether lights from many towers would be confusing, two words: Buzzards Bay. old timer– we live in a capitalist society– every project is a money making scheme. Whoa. People want free electricity? That would be (checks notes) communism! new englander– there are a number of communist countries around the world. Not one of them supplies free electricity to it’s citizens. Never have and never will. And if you want to talk about free energy, take a look at the cost of gas around the world. U S gas is cheap. I’m being sarcastic. I’ve met many who claim people who want free stuff from the government are communists because that is what communist governments do. I need to find better people. No NewEnglander. Socialism is Communism with the absence of terror. That’s an interesting comment, Andrew. Many use the labels interchangeably. Andrew– it is my opinion that you often post really off the wall, incoherent things– but i really have to ask WT. heck you are talking about with this comment ? Andrew– are you telling us that the ” National Socialist German Workers’ Party ” had no “terror” associated with it ? new englander — could you show one comment on this forum to back up your comment that anyone want’s “free electricity” ? I think you should thank the editor of this publication for restricting me as to publishing my opinion about what i really think about your comment. A 100-ft tower would not be visible greater than 12.2 miles away. How high are these turbines to be? old timer– let me address your comment above that asks ” Why did the Europeans stop issuing permits for these and stopping future windfarms? ” The simple answer is because they didn’t . Eighteen off shore windfarms were added to on line electrical generation in european waters in 2018. While the capacity of new offshore windfarms in Europe dropped last year, ( 2.65 gw in 2018 down from 3.15 gw in 2017) they have hardly stopped future windfarms.